It's a terrible winter in New Mexico and southern Colorado! I've only been snowboarding once this entire season compared to a normal 30 or 40 days and I'm afraid I won't get out much more in the next few months. 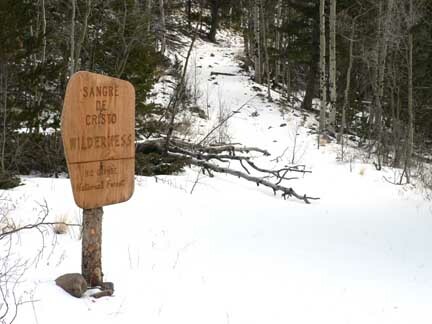 On the flipside though, winter ascents of peaks in the Sangre de Cristo's are significantly easier with this extreme lack of snow. With that in mind and a favorable forecast for Saturday, Bill and I left Los Alamos after work on Friday headed north to the Major Creek trailhead to camp and explore a section of the Sangres we had driven past at least a hundred times and never had stopped. We awoke in our tent at 6:30am at the Major Creek trailhead as the sky was starting to get light. We had chosen to camp at the Major Creek TH after hearing of good camping here compared to the dirt lot at the Hot Spring TH, our planned trailhead. The camping was indeed plentiful and decent. The overnight low had reached about 14F which was warmer than we had planned as the San Luis Valley can get brutally cold. After heating some water and eating some hot oatmeal, we drove the very short distance to the Hot Spring TH and packed up. We opted to leave the snowshoes in the car after recalling a thread on 14erWorld about how dumb it is to use snowshoes. In actuality, the amount of snow was dismal and we assumed we wouldn't need them anyway. We started hiking just before 8:00am. The trail was quite dry for the first half mile or so but became snow-covered in short order. The snow cover was very shallow and just enough to hide the ice from the various water flows along the bottom of the canyon. We slipped and slid a couple of times but never went boom. An hour into it we reached the wilderness boundary and took a short water break. At the wilderness boundary in Hot Springs Canyon. The snow immediately turned deeper after passing into the wilderness but never exceeded a knee-deep depth and soon became more shallow again so progress wasn't slowed too much. It was obvious we were the first people up this trail in a long time but the rabbits had been very active. The bummer part about rabbits is that they stay on top of the snow all too well and really do a poor job of trail breaking. So it was up to us to boot-pack our way up. Just below treeline the snow was again knee-deep and the canyon was a bit narrower. Breaking trail on the side-hill just above the creek wasn't awesome but wasn't too bad either. The shallow, narrow creek just below treeline with an unnamed point in the background. At treeline just before 10:00am, we took another break for food and water and marveled at what a beautiful day it was. Our watches read 43 degrees and we couldn't hear any wind at all. Would we be lucky enough to avoid any serious wind up high? Doubtful, but it was a pleasant thought. Onward and upward we took the right "fork" of the two branches of the shallow creek and were soon on the ridge west of Cottonwood Peak. The wind was now starting to pick up a bit but if we stayed on the south side of the ridge, we didn't notice it too much. We neared the top of what we believed was the summit (we should have looked at our altimeters though!) and realized it was one of two false summits along the ridge. 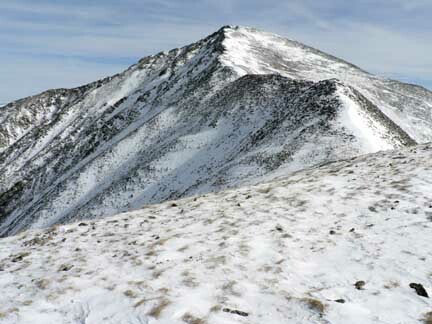 View of Cottonwood Peak from the first false summit along the western ridge. The wind picked up so we busted out the balaclavas and neck gaiters as we moved up the ridge. The going was difficult because there was just enough snow to make rock hopping not possible but not enough to support our body weight forcing us to punch through the snow more often than we'd like and twisting our ankles a bit each time. We reached the summit in strong winds and blowing snow at 11:55am. The register was sticking out of the summit cairn so despite the brutally cold wind, I signed us in. We were the first to sign the register since November 26th, 2005 which surprised me since the winter had been so warm and I had expected more hikers on these mountains. Bill and I yelled over the wind noise discussing our options since we had planned to head over to nearby Thirsty Peak but the winds were taking a toll on our spirits. We decided to head down to the low point between Cottonwood Peak and UN13,123' to make a decision. The descent was slow and deliberant, again because of the shallow snowpack on loose, hidden rocks. At the low point we found a wind-sheltered spot on the northeast side of the ridge and had time to warm up, snack and discuss the plan. 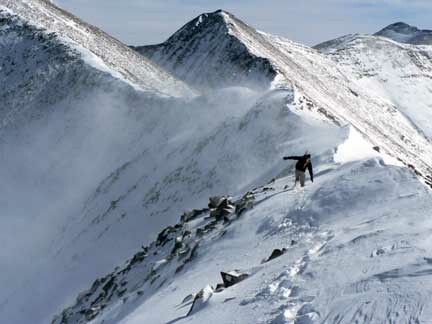 We didn't see any snow plumes on the ridge towards Thirsty Peak and thus decided to carry on with the plan. Bill heading towards UN13,123' (out of frame to the left) with Thirsty Peak in the background. The wind was still pretty brutal and it numbed the right side of our faces as we traversed the ridge but the blowing snow had pretty much stopped so it wasn't so bad anymore. Also, the snow on the ridge was more firm so the going was a bit more enjoyable. At 1:00pm we reached the summit of UN13,123' but didn't stay long because of the wind. We continued south along the ridge towards Thirsty Peak which looked pretty damn cool. I saw many good looking lines that would go nicely on a snowboard if only there was some more snow! Perhaps I'll go back in the springs assuming it snows some more! 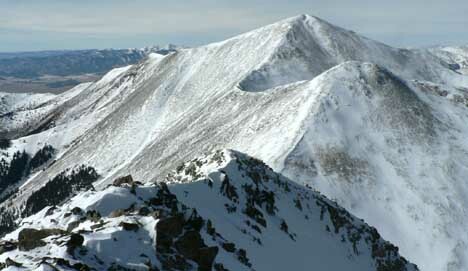 The north face of Thirsty Peak. The distance was deceiving and we reached the summit of Thirsty Peak sooner than we had expected at 1:45pm. It was still very windy but we wanted to eat some food so we dropped east off the summit a bit where the wind was not as bad and ate. The view of the partially frozen Brush Lakes was nice to take in as we ate. We descended the ridge back to the low point between Thirsty and UN13,123' and then descended down along a faint ridge into Garner Basin. We were looking for the trail as we descended into a large stand of Aspen trees but didn't have much luck finding the trail. 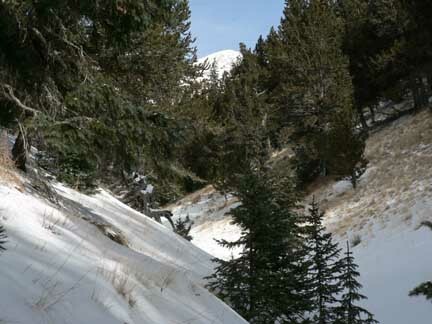 Instead we found what Bill coined, "Death Rails"--downed, old, and slick Aspens covered with an inch or two of snow that nearly put us on our asses numerous times! We eventually located the trail once we reached the creek and made good time after that back to the vehicle at 4:50pm. This was a great loop hike and a very nice winter outing. The proximity of this trail to our homes in Los Alamos also made it quite appealing. I now have an itch to explore many of the other peaks in the Northern Sangres that I've normally just driven past! Written by Jason Halladay on 05 January 2006 for TheMountainInstitute.com.